"If you slice kale thin and toss it with other tasty treats like apple, persimmon, orange, and nuts, the kale mellows out and serves as a perfect foil for other vegetation." Whisk vinegar, orange juice, Dijon mustard, orange zest, cumin, and red pepper flakes together in a bowl. Slowly pour olive oil into the orange juice mixture, whisking until thick and thoroughly combined. Season dressing with salt and black pepper. Remove stems from each leaf of kale. Stack 3 to 4 leaves of kale and roll together. Finely slice kale leaves crosswise to create thin ribbons. 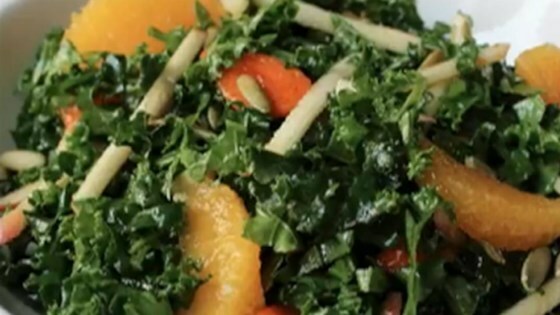 Combine sliced kale, persimmon, apple, orange, and pistachio nuts in a bowl. Add dressing and toss until well coated. Chef John's Waldorf salad with apples, celery root, walnuts, and grapes. Learn how to make orange supremes in this video. You can use pistachios or the nut of your choice. Nice enough, but my family found the flavor a bit strong, so we didn't really enjoy it much. THANKS CHEF JOHN! A-1 SALAD. ALWAYS LOOKING FOR HEALTHY WAYS TO SNEAK FOOD IN MY FAMILY'S MOUTHS! DID NOT HAVE PERSIMMONS, HOWEVER I HAD SOME REALLY SWEET STRAWBERRIES THAT DID THE TRICK.